The stereotype of a single mom is a teenager. She and her boyfriend have had an accidental pregnancy and are not prepared to be parents. That stereotype isn’t all wrong. A large fraction (37 percent) of single mothers started their childbearing in this way. A slightly older group of young women in their early to mid-twenties are also drifting into single parenthood accidentally. The result: fully 60 percent of all births to unmarried women under the age of 30 are unplanned, and close to half of their kids will grow up in poverty. But there is a new and growing category of unmarried parents: single mothers by choice. They are women who have thought hard about whether to have (or adopt) a child and have made a careful decision to do so. Unlike those who drift into parenthood unintentionally, they are likely to be much better prepared to raise a child. They are not only older, but better-educated and more financially prepared to take on the task. Call them the true super moms of the family story. 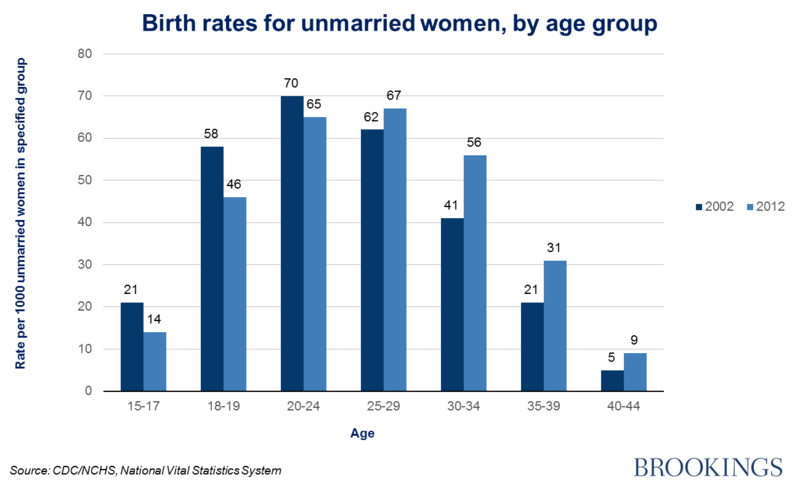 Between 2002 and 2012, unwed pregnancy rates plunged among teens and even declined a bit among women in their twenties — but rose among older women, most especially those over 30. To be sure, we do not know whether all of these births among older women were intended. What we do know from the data is that they are much more likely to be intended than births to younger women. (It also seems unlikely that the increase in childbearing among older unmarried women was due to a greater failure to control their fertility in 2012 as compared to a decade earlier.) The most reasonable conclusion, then, is that more of these women are choosing motherhood, quite deliberately. They may or may not have a cohabiting partner. Those with a partner may be a harbinger of the more stable, long-term cohabiting relationships now prevalent in the Nordic countries and parts of Europe but still relatively scarce in the U.S.
Those without a cohabiting partner are the single mothers by choice. They give a variety of reasons for their decision. Many had hoped to find a soul mate but never did. Some like the autonomy of going it alone, believing that shared decision-making with a spouse or partner would just complicate their lives. They are typically deeply committed to their children and prepared to accept the social stigma and extra burdens that being a single mother entails. Their stories are diverse (see the website Single Mothers by Choice for more detail) but one thing seems certain: this group is likely to become more numerous as the stigma of single parenting continues to fade and as women’s earning power and sense of independence continue to increase. That doesn’t mean there are no downsides to this growing trend. These single moms have no one with whom to share the financial, logistical, or emotional burdens of being a parent. Their children are deprived of a father and have lost something in the process. Uncles and best friends are an incomplete substitute for having one’s own father in the home. It’s hard to imagine a whole society in which single motherhood, even if freely chosen, is the new norm. Still, what matters most is not the structure of the family but the quality of parenting. On that score, single mothers by choice are doing an amazing job. Happy mother’s day to all of them.